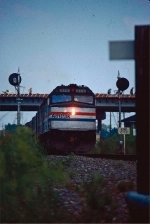 Description: Amtrak Train No. 48, the "Lake Shore Limited". 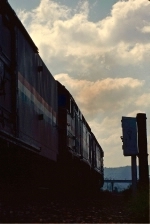 Description: This is from the first series of railroad photos I ever took in June, 1982. I was 9 years old. Exact date unknown. Description: Amtrak 8 backs from the SOO yard to the BN. Description: Amtrak 8 leaves La Crosse on the BN at Grand Crossing due to the single track project on the SOO. Description: Amtrak 449 passes the waiting MASE in Palmer at 19:13. Description: I have never forgived myself for shooting B&W on this trip through Montana. Description: Amtrak 7 on the Hillsboro Sub heading for Grand Forks and running quite late. 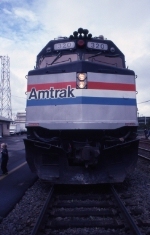 Description: Amtrak 51, Cardinal, at Alexandria, Virginia.